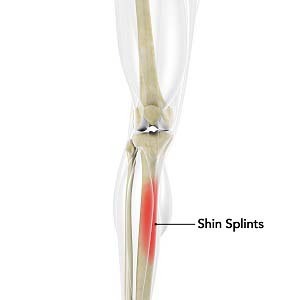 The term "Shin splints" is used to describe the pain and inflammation of the tendons, muscles and bone tissue around the tibia or shine bone (a large bone in the lower leg). It occurs because of vigorous physical activity such as exercise or sports. The condition is also referred to as medial tibial stress syndrome (MTSS). The most commonly occurring symptoms include pain in front side of the lower leg. Some children experience pain during or after exercises. Mild swelling may be accompanied in the lower leg and your child may feel weak or numb. Rest : Ensure that your child takes adequate rest and avoids activity that causes pain for at least 2-4 weeks. They can try low-impact exercises, such as swimming, bicycling or underwater running. Ice : Apply ice packs wrapped over a cloth to the affected area for 15-20 minutes four times a day for several days. Never place ice directly on the skin. Supportive shoes : Ensure that your child wears shoes that provide good cushioning and support the feet as it helps reduce the stress on the shin bone.